Today we welcome guest author Joy, who’s going to introduce us to Labely Emojis. I played around on the site for a while and the emojis are easy and fun to make! FYI, I didn’t receive any compensation for posting this article. Emojis are more than just cute, visual substitutes for words. Aside from their fun side, they are also used in education, marketing and other purposeful situations. If you have an emoji project you wish to add a dash of imagination to and have fun along the way, Labeley Emoji might be the perfect choice. Labeley Emoji is a brand new web-based tool for creating personalized emoji stickers. With emoji popularity rising every day, users now have a chance to communicate their message in the most creative way: by creating their very own emoticons, downloading and using in virtual and physical reality. The idea behind the tool is to awaken users’ creativity and designing skills, and to give them a full control over the sticker making process. Labeley Emoji is a completely free PC alternative to similar mobile apps with a key distinction of custom, totally unique emoji sticker creation. It is Ideal for users who prefer using good old PCs and laptops for their digital project creation and management. So, how can you get free emoji stickers with Labeley? The tool comes with a sleek and user-friendly interface so designing your very own emoji has never been easier. Once you click on the Start Designing button and choose emoji category, on the left side of the screen you will a plethora of pre-designed graphics you can use for creating your unique emoji sticker. You start by choosing your emoji shape and continue by adding additional elements such as emoji eyebrows, face features, background color, and so on. 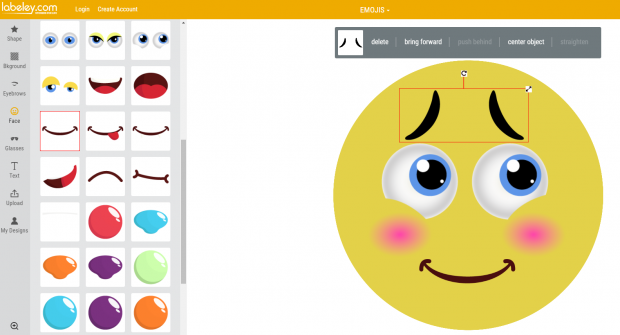 You can even upload your own graphics and add text to your emoji design. Once your emoji sticker is ready, first thing you need to do is save it by clicking on the ‘Save Label’ button. Your design will automatically be saved under ‘My Designs’ folder from which you can download the emoji sticker by right-clicking on it. If you plan on using Labeley Emoji on a more regular basis, it makes sense to create a user account; that way you can access all of your emoji designs anytime. Aside from custom emoji sticker creation, Labeley.com offers free tools to create stickers and labels for all sorts of purposes and occasions: from household and kids stickers to craft beer and wine labels to birthday parties, business events and more. Find out how easy and quick it is to generate all the stickers you may need in your daily life! Thanks Joy! To be honest, I didn’t try to save or download the emoji I created, but I sure had fun making them. If you try Labely Emoji be sure to let me know what you think!